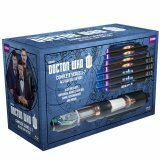 For the first time ever, BBC Home Entertainment is collecting the complete new Doctor Who together on Blu-ray along with an amazing assortment of additional items, including a completely unique Doctor Who Universal Remote Control Sonic Screwdriver, three original art cards, and an exclusive Doctor Who comic book. The collection includes Series 1-4, featuring Ninth Doctor Christopher Eccleston and Tenth Doctor David Tennant, making their Blu-ray debut in newly remastered versions at full 1080p high definition, plus the David Tennant Specials collection and Series 5-7 featuring Eleventh Doctor Matt Smith, also on 1080p high definition Blu-ray. All the bonus features from the previous releases are included, as is a bonus disc with three new-to-Blu-ray specials: The Brit List's Ultimate Doctor Who List of Lists; The Best of the Christmas Specials; and the full 90-minute Doctor Who at the Proms, newly remastered with 5.1 Surround Sound. All 13 episodes of the relaunched version of the BBC television sci-fi classic, written by Russell T. Davies and starring Christopher Eccleston as the legendary Time Lord. In this series, the Doctor meets new companion Rose Tyler (Billie Piper) while saving her from the living-plastic Nestene Consciousness, before taking her on adventures through time and space, where she meets Charles Dickens (Simon Callow), tries to save her father from dying when she was a child, and helps the Doctor and Captain Jack Harkness (John Barrowman) battle the evil Daleks and save the world. Episodes are: 'Rose'; 'The End of the World'; 'The Unquiet Dead'; 'Aliens of London'; 'World War Three'; 'Dalek'; 'The Long Game'; 'Father's Day'; 'The Empty Child'; 'The Doctor Dances'; 'Boom Town'; 'Bad Wolf'; and 'The Parting of the Ways'.